I have turned Canberra’s Green Spaces into Italy’s Green Spaces for a month or so to show some of the wonderful green spaces we found in Italy. 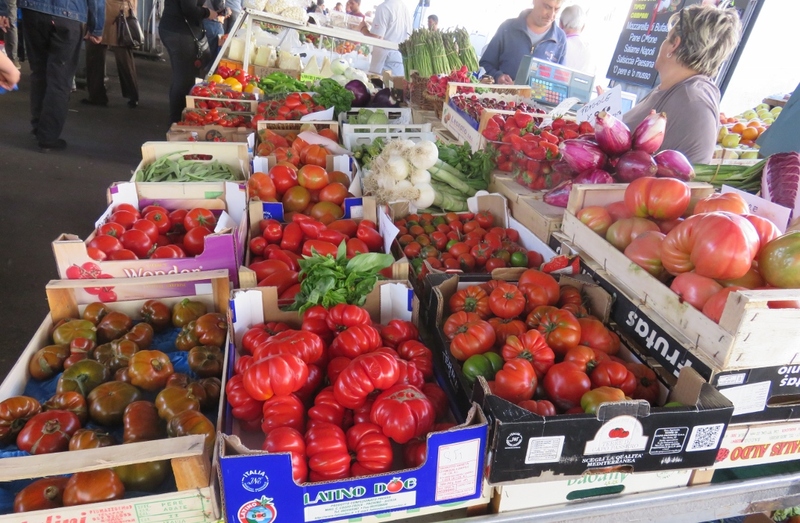 Parks are always a welcome sight for me in new city, and Paul and I also share a love of markets….the food that people eat and grow and the produce for sale is so much part of the flavour of a country. 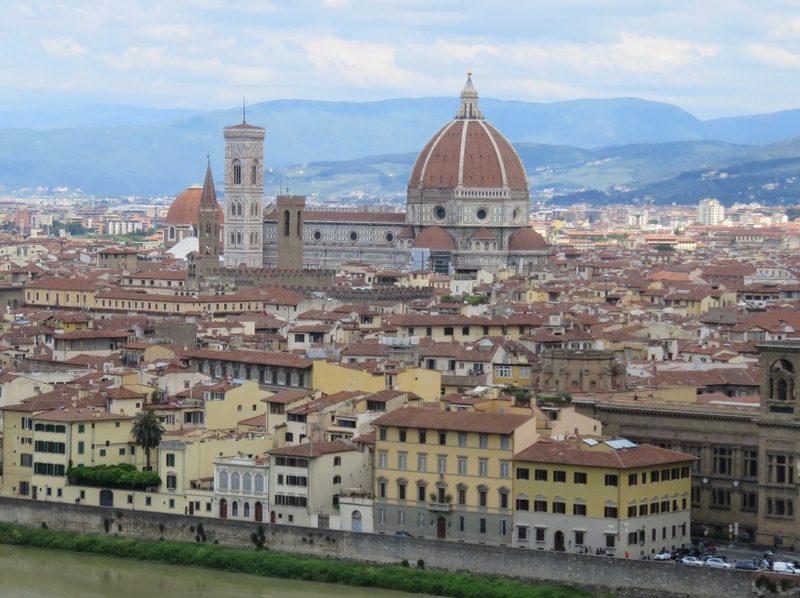 Here we are in Florence, even on a dull day, who could resist such a beautiful city? 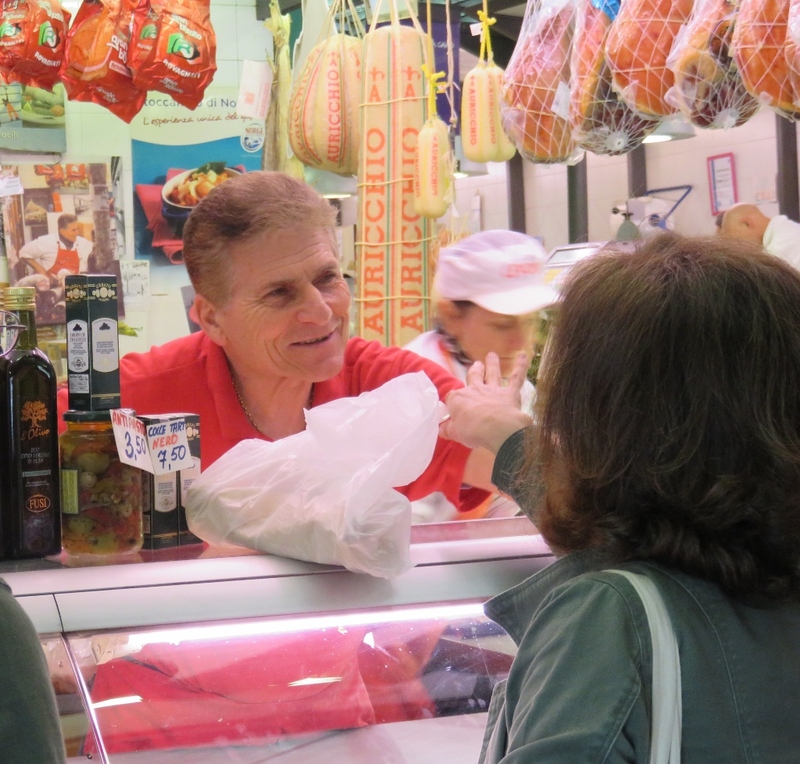 We have organised to join a food tour of the markets in Florence. We did this tour, and many others through The Walking Tours of Italy, and they were all good. 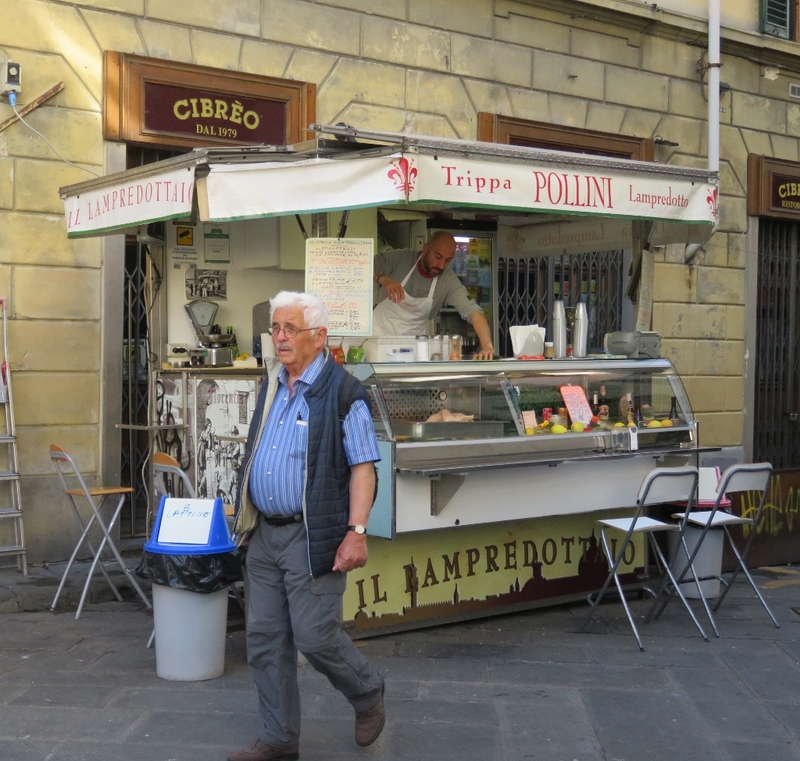 Anna, our vivacious guide told us that tripe is a special, much loved, dish in Florence, and indeed when we arrived at this stall Italians were stopping off for a dish of Lampredotto (spiced tripe), in the same way we would stop off for a coffee. Anna said in her charming Italian way that, usually, men were much more prepared to try this dish because it was the manly thing to do to try dishes that may not appeal immediately. That was me off the hook, I have to confess, I love food, but I’m not very adventurous. All the guys on the tour tried it…how could they not try?? I don’t think Paul was that thrilled, but he finished most of it. This was a great start to the tour because everyone began to talk about their favourite dishes back home. Here we are at our next stop, an Enoteca (wine shop). 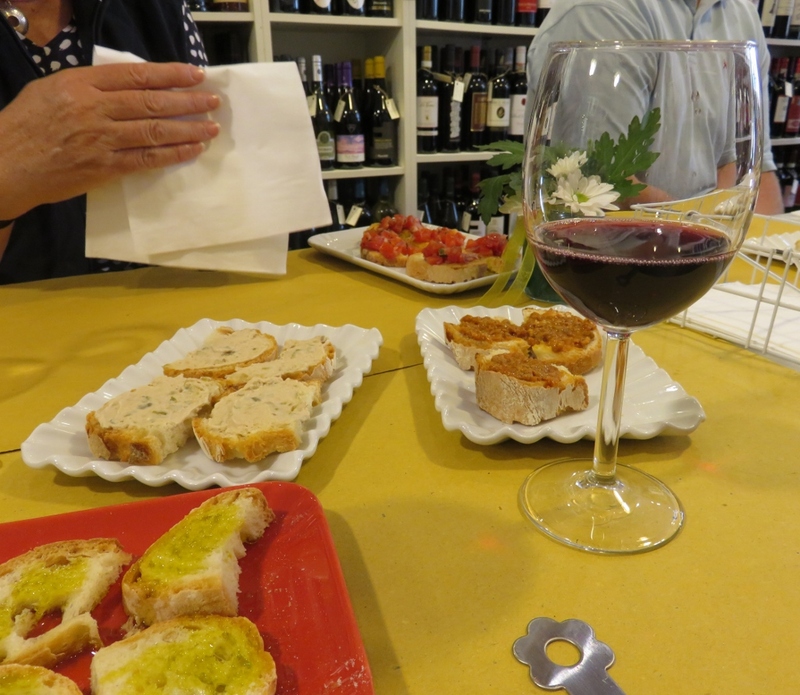 The shopkeeper had some Bruschetta with tomato and basil, bread with olive paste, some with fish paste, and some with extra virgin olive oil. We had noticed this tradition in Venice, in fact I had seen a woman strongly resembling my Mum with a shopping bag stopping off for a Prosecco one morning. 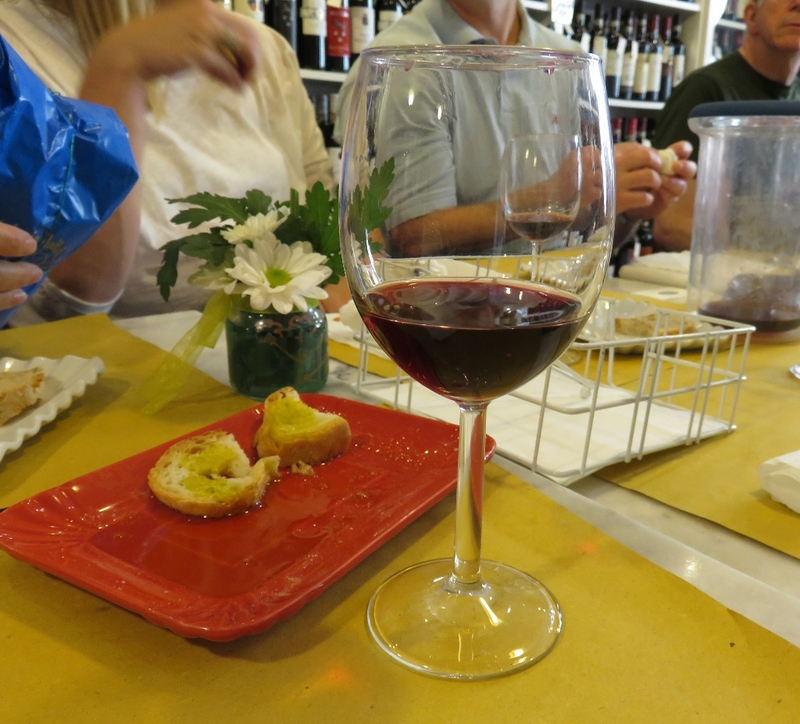 I wondered about the wisdom of having something like this to drink at the beginning of tour, but Tuscan Chianti and the Sicilian wine were very light, and most enjoyable. 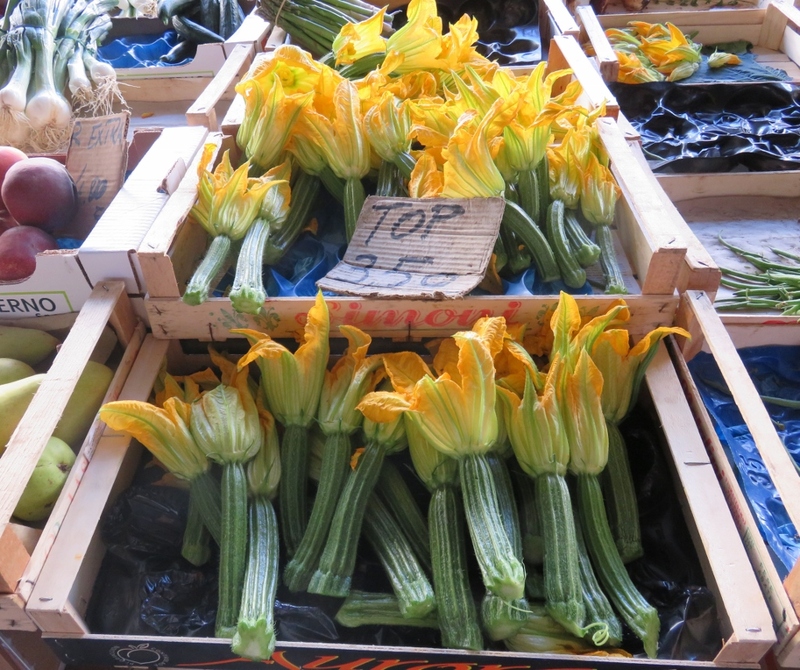 Zucchini flowers are very popular and stuffed with vegetables and/or meat mixtures, often seen in restaurants. There were plastic tops on these plants, and I have no idea what their purpose is. The choice of cheeses and meats was amazing. The sellers pride themselves in all their produce, and love describing the cooking and curing of these cheeses and meats. Many of the butchers, fishmongers, cheese sellers in Italy belonged to families who had been doing this for three or more generations. There is real pride in their product. We ended the tour at a gelato shop. The gelato was wonderful, but I was too busy eating and talking to even think of taking a photo at that point. 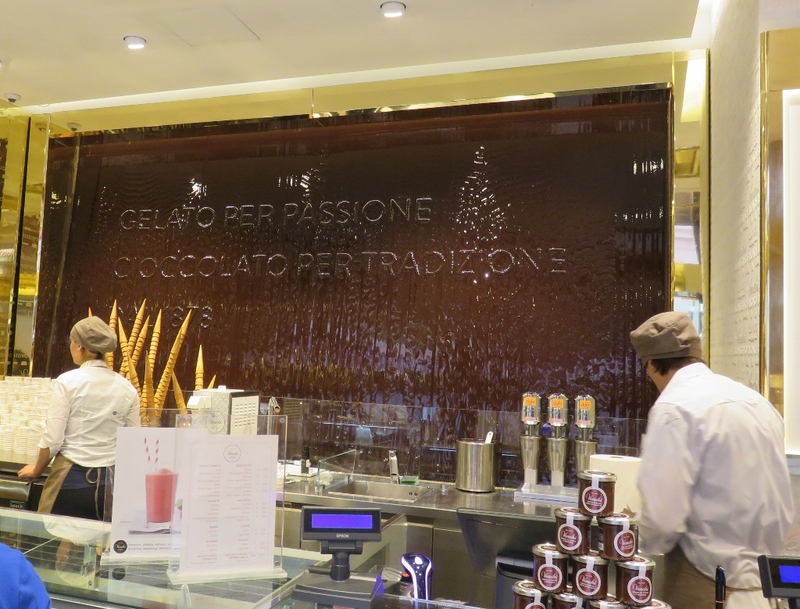 However, we did visit another fantastic gelato shop before we left Florence,and I was attracted to it because it appeared to have chocolate streaming down the walls.. …what can you say…. Have a happy week of gardening, growing and eating! This entry was posted in Italian Green Spaces on June 20, 2016 by germac4. A chocolate waterfall …. dream made in heaven. Looks just like the kind of holiday I love. If we had been any closer I would have posted some back to you, a chocolate gelato appreciator was needed to help me! I love markets everywhere. It is always something we do on holiday, I think you get to understand a place by its food. I agree! Markets are good fun, and they do tell you so much about the people. Thanks for the tour! Tripe! Gag! No amount of spice would convince me to swallow! 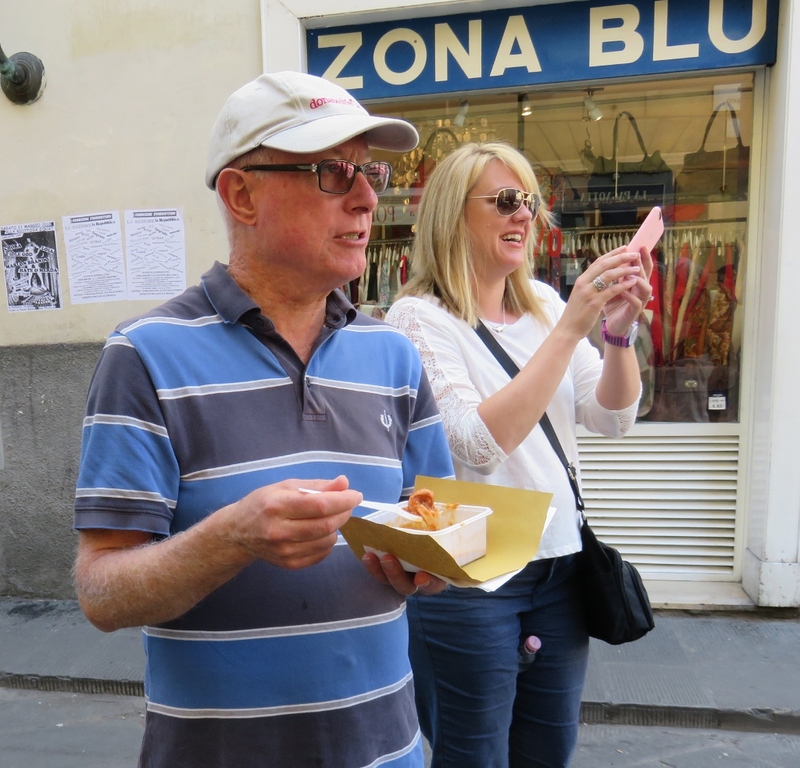 Cheese, meats and gelato, I am right there…Good thing you both are walking! And Prosecco in the AM is a wonderful idea…but I am afraid I would not get much walking done afterwards. Here in central VA, it is now officially the summer solstice today and the temps rose early to 95F. Ran early to collect a few bags of mulch to tuck in a few newly added plants, and that is it for the summer for this gardener. Other than mowing and pulling the occasional weed, no time will be spent in the garden again until the fall. I am not a hot/humid weather hound. I hate hot humid weather too…..I’m a spring and autumn person. 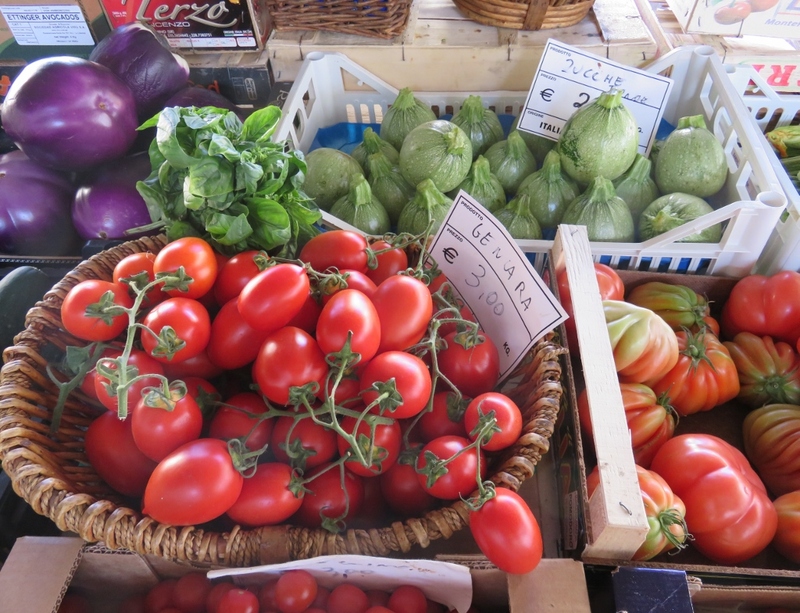 There was an amazing choice of tomatoes, perhaps because so much of the Italian cooking is based on tomato. Yes, markets everywhere are great aren’t they? A glass of wine at 11.00 a.m. sounds very civilised but it would zonk me out for the day! I think you have to be born into a family/country eating tripe…otherwise no! 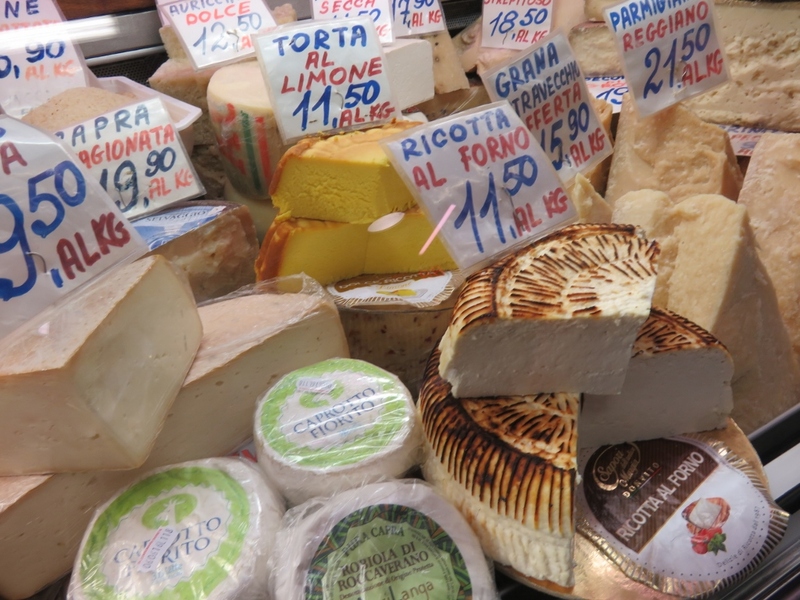 We sampled lots of lovely cheeses and hams, but the tripe was the only thing I could not come even think of trying! I’m so glad you are going to share pictures from your trip to Italy. Looks absolutely magical. 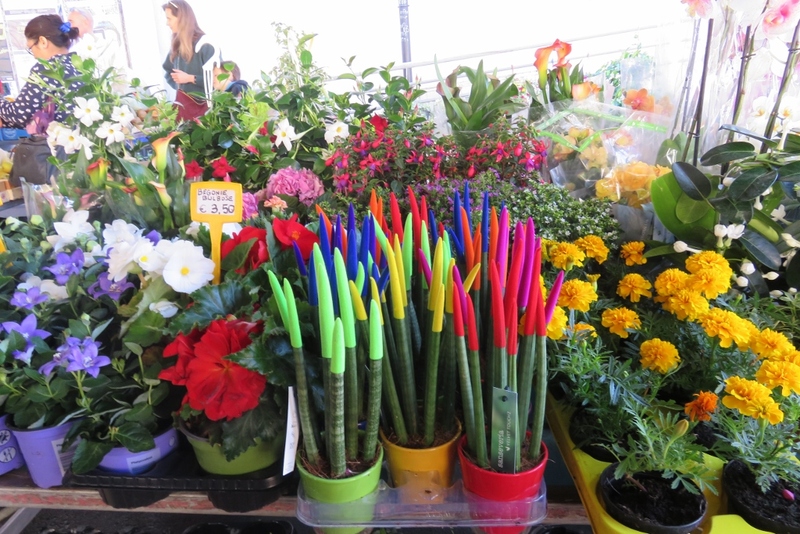 We also love open air markets, and always try to visit them when we are in a new city. I would have skipped the tripe though, despite the appeal to manliness. Paul says you didn’t miss a thing skipping the tripe! Yes, markets give such a flavour of a country or city. Oh, I’m so glad you took us along on this tour of Florence! That city is absolutely beautiful. Your photos are great, Gerrie. The market looks fascinating! Thanks Carol, we went to markets in Florence, Venice and Rome, so I’ll post a bit on each, such a great way to see the ”inside” of a city. Yes, and Italy does have quite different food in different regions. I don’t think there was one positive vote for the tripe!